There are times when something we’ve planted grows well…and then keeps on growing. And growing, and growing. Every season such plants take over more territory, crowd out neighboring selections, and generally behave like assertive thugs. Some gardeners love such plants. They enjoy the spreading and gladly dig and share the excess with friends and neighbors. 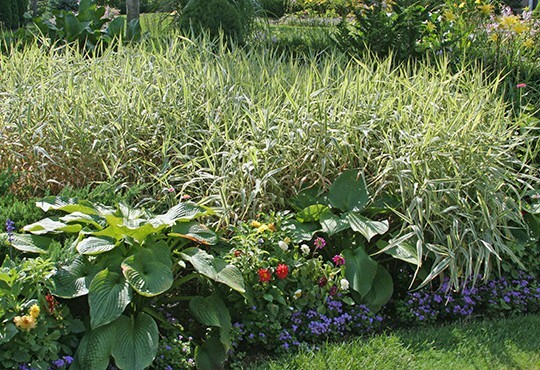 Others are dismayed to see their gardens becoming overrun with one type of plant. They periodically scramble to pull or contain the over-achiever, sometimes successfully, and other times less effectively. Unfortunately people are often hesitant to throw the edited plants away. I frequently visit properties where these clumps of vigorous growers have been planted all over the yard, resulting in landscapes where black-eyed Susans, ribbon grass, or Siberian iris now dominate in all areas. Not that any of the aforementioned plants are necessarily bad selections. It’s just that we, as gardeners, need to acknowledge how quickly they grow and be willing to divide and remove them when necessary. It’s not just the plant world where sometimes things grow too well. Perhaps you’ve found yourself overwhelmed with assorted commitments that are basically good things…yet somehow it’s all gotten out of hand. There are times for casting a hard eye on what’s growing a bit too quickly, and applying an appreciative but firm controlling hand. Some garden tips about controlling plants can be found in Share The Wealth, below. When it comes to work, volunteer activities, family, and the holidays…well, all I can say is learn from your gardens and may The Force be with you. Consider the ribbon grass, how it grows. It toils not….but I digress. Phalaris arundinacea, ribbon grass, looks great in the pot in the garden center. Later you’ll discover that it wants to control the world, and it doesn’t even care if it’s well dressed during its rampage. Ribbon grass looks ratty from about the mid-August on, and it doesn’t play well with others. Grow it in a pot, or not at all. Here’s the rule I use: if a plant more than doubles its size from one season to the next, that’s an invasive plant and it has to go. Proceed to the burn pile, do not pass Go (or the compost pile) and do not collect $200. (Such plants want a Monopoly, hence the association in my mind.) Yes, I may want a fast-spreading ground cover, but there’s a limit! If you’re willing to edit out an overachiever plant on an annual basis, and don’t mind throwing the excess away, by all means keep that selection in your garden. Be honest about your time and energy, however. Grow them in containers! If you especially love one of the classic garden thugs, raise it in a pot. A word to the wise, however: such plants can often be seen growing out the bottom drainage holes. Use saucers so that they don’t root in the soil. Forewarned is forearmed. If someone wants to give you a plant from their garden it just might be a fast-spreader. Ask yourself this: do I really want something that I too will need to edit and control in three or four years?